Inspiring Art Teachers to Explore Art History | Curator’s Corner: What Is Realism? American art has always been characterized by a strong reverence for realism, from the early colonial portraits by artists such as John Singleton Copley, through the Hudson River School, and into the 20th century with Photo Realism. It is always interesting to compare the various types of “realism” that one finds when studying art through the ages. For instance, extremely detailed realism of the physical world was a hallmark of Flemish painting during the Renaissance (c1440–1600). Obviously in the several centuries that elapsed between the van Eyck painting and the Tanner work, artists’ training and focus changed, even though overall a riveting realism was the intent of both of these artists. Van Eyck was one of the great masters of the Northern Renaissance. Trained as a manuscript illuminator and goldsmith, his works are jewels of observed detail in man’s world. Unlike painting in Italy at the time, which tended to idealize form (an influence of ancient Greek and Roman art), northern artists such as van Eyck used intense direct observation of the physical world to instill the objects in their works with symbolism. Ironically such interest in direct observation did not extend to anatomy, for they had no ancient sculpture with which to study the human form, and there were no anatomy classes. Tanner was the first African American artist to achieve international recognition. He studied in Philadelphia under the great realist Thomas Eakins (1844–1916) who encouraged him to work from live models. After moving to France, he was influenced by the palette of the impressionists and the interest in dramatic lighting effects of the Realism movement of earlier in the 19th century. 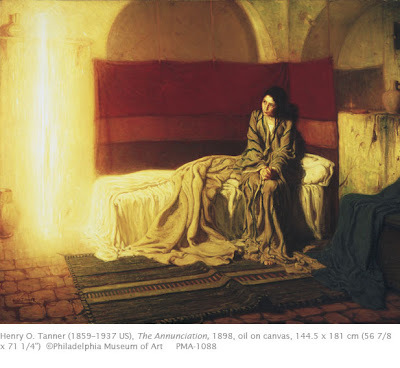 This painting comes from the period of the 1890s when Tanner painted many intensely spiritual works. Let’s concentrate on the differences in the two versions of the same subject. Van Eyck’s is set in a Gothic church, sacred space, whereas Tanner’s is located in the Virgin Mary’s humble room. The van Eyck has uniform lighting, where Tanner’s heightens the dramatic impact by presenting the angel as a column of light. Van Eyck’s perspective is intuitive, non-linear (we learn about linear perspective in many Davis textbooks), where Tanner’s room is logically constructed according to linear perspective. Tanner emphasizes the emotional impact of the event, where van Eyck represents a placid, accepting Virgin. Van Eyck’s Virgin is dressed in queenly raiment where Tanner’s truly looks like a humble girl from Judah. Now, you compare the two paintings for their similarities!